I used the rainy weather we had this past weekend in Arizona, as an excuse to stay in and cook up a storm. I made a loaf of seeded semolina bread, a roasted peppered salad, fresh rotini pasta and a warming pork & kale ragu. The ragu was definitely the star of the meal. It was hearty, but not too heavy, and the added kale made it feel almost healthy. The bitter cabbage taste of kale is complimented by the sweet fork tender pork and currants. Slightly adapted from a recipe I saw on Bon Appetite the ragu is a rustic one pot dish that would make a delicious family dinner. Season pork with salt and pepper. Heat 1/4 cup oil in a large heavy pot over medium-high heat. Working in batches, cook meat, turning occasionally, until browned, 10-15 minutes; transfer to a large plate. Drain all but 2 Tbsp. fat from pot. Reduce heat to medium and cook onion, carrot, celery, and garlic, stirring occasionally, until golden brown, 8-10 minutes. Tie rosemary, oregano, and bay leaf into a bundle with kitchen twine; add to pot along with pork, tomatoes, wine, peppercorns, nutmeg, and cloves. Add water just to cover meat and bring to a boil. Cover, reduce heat, and simmer, adding more water as needed, until meat is very tender, 1-1 1/2 hours. Discard herb bundle. Using 2 forks, shred meat in pot; cook, uncovered, over medium heat until sauce is thickened, 8-10 minutes. Cook pasta in a large pot of boiling salted water, stirring occasionally, until al dente; drain, reserving 1/2 cup pasta cooking liquid. Add currants, if using, and kale to ragu; cook until kale is soft, about 4 minutes. Add pasta; cook, adding reserved pasta cooking liquid as needed, until sauce coats pasta. Mix in 1/2 cup Parmesan; season with salt and pepper., Serve pasta drizzled with oil and topped with more Parmesan. YUMMMMMM! I am at work so hungry right now and this is making my mouth water! Pinned for later. Can't wait to try. Pinned! I will probably be substituting spinach for the kale since my family really doesn't like kale. I love the addition of currants here - their sweetness must be lovely with kale! Comfort food in a bowl! I'm all for this combo. The way you describe the ragu as a rustic one pot dish sounds amazing! Your ragu looks amazing. Also, I think rainy weather is the best excuse for cooking like crazy! Comfort food with healthy kale, great idea! It's still chilly over here so this dish looks so warning and hearty! Kale and pork is a marriage made in heaven. This dish is totally calling my name - it looks beyond fantastic! Saving this one for later! Looks delicious! I've been adding kale to everything lately. It never seems to not go! I love that you used currants, too! I am loving this ragu! And the touch of healthy kale is a winner in my book! 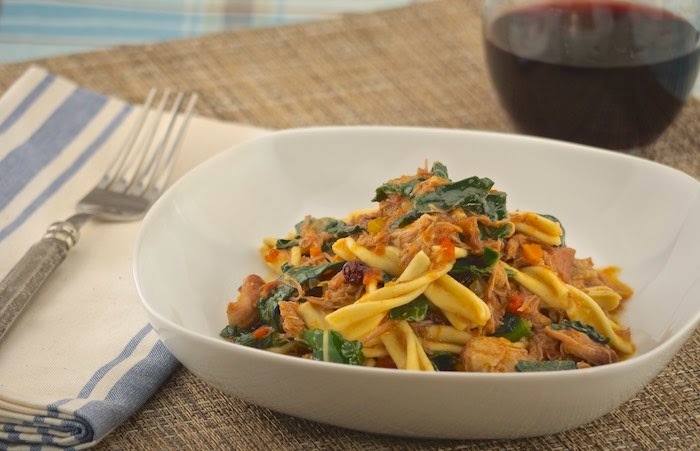 Yum, I love ragu, this sounds so good with the kale and the currants too! Sounds like a great dish. I will probably use spinach in lieu of kale because no matter how much I try, I just can't fall in love w/ kale. This looks so delicious! Love all that hearty kale...yum!